A few years ago, I used to hear the word “salad” and it used to fill me with feelings of panic that I would be scavenging around the kitchen an hour later, starving hungry because a few lettuce leaves wouldn’t fill me up all afternoon. And those who know me, know that nothing sends me into a panic like the fear of hunger….except maybe clowns - those guys get me every damn time. But those days are no longer! This salad is properly hearty (aka filling enough to keep you satisfied all afternoon long) due to a combination of complex carbs (from the wholegrain freekah), 19g of plant-based protein and a massive 40% of my daily fibre requirements thanks to, in part, the SIX different brightly coloured veggies. And it’s these vegetables that provide a huge 82% of my daily Vitamin C too. This salad is also great for meal prepping because it doesn’t take long to assemble and it lasts very well for several days in the fridge in an airtight container. It was such a good make-in-advance option that we took a big batch of it away with us on our camping trip (in the photo below), and boy was I pleased we did! Whilst in the past, we would have been eating baked beans on repeat; this time we tucked into the salad, safe in the knowledge that however many s’mores we devoured later on, at least we had a nutritionally dense lunch to set us off on the right foot! So it is a good option to make in advance when you know you have a busy few days coming up, or if you take your lunches with you to work. If you aren’t familiar with Freekah then I recommend you hop to it, stat! Wholegrain freekah is higher in fibre and protein than standard wheat and is a good source of many micronutrients. It has a low GI and a wonderful nutty, smoky flavour. Much like rice, you either boil it for 20 minutes or so; or else Merchant Gourmet do handy pre-cooked pouches that are perfect to throw into a soup or stew, as well as a salad. I used the same dressing here as I did for my last salad post (be sure to check that one out too! ), because I always have a big batch of zesty lemon, tahini & shallot vinaigrette in my fridge. It takes 2 minutes to make, but lasts for ages in a glass jar in the fridge. Also like my previous salad, this one can double up as a great plant-based dinner as well, simply heat up et viola! Dinner is served. 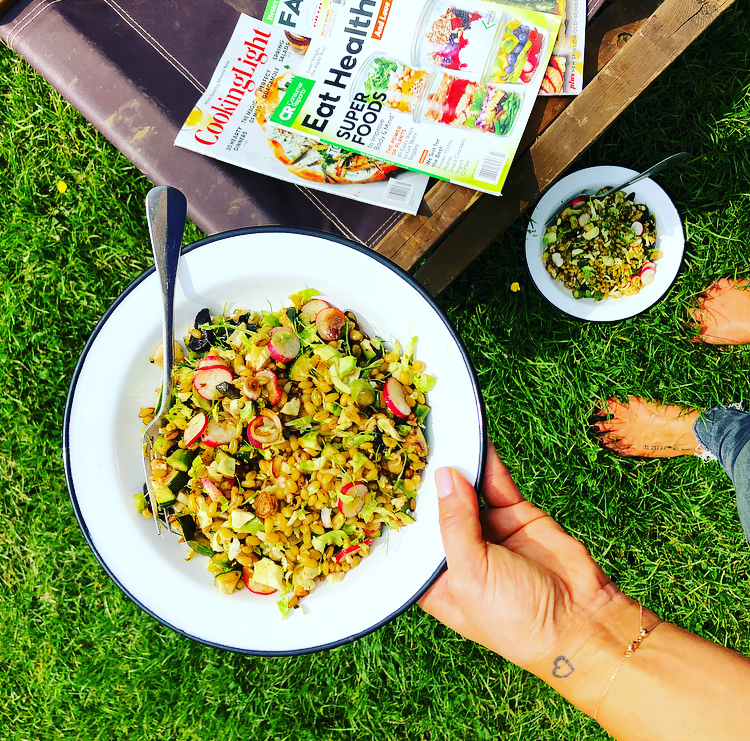 · Dice the courgettes, finely chop the Brussel sprouts and spring onions, halve the tomatoes and thinly slice the radishes. · Heat up the oil in a frying pan, and sauté the courgettes until browning slightly. Set aside. · In the same frying pan, fry the tempeh slices for a few minutes on each side. Set aside. · To defrost the peas and edamame, simply put them into a bowl of boiling hot water for a few minutes. · Drain the peas and edamame, chop the tofurky slices and assemble the salad. · Add all of the ingredients for the dressing into a small mixing bowl and whisk to combine. · Drizzle the salad with the lemon vinaigrette and serve. · Note – this salad will last for a few days in the fridge so is a great one to make in advance to take to work.